Carbondale & Rural Fire Protection District was paged to Roaring Fork High School on Wednesday, April 6, 2016, at 12:38 p.m. for a report of fire alarm and water flowing from a sprinkler head. Crews on scene found a sprinkler head in the auxiliary gym had activated and was flowing water. At 12:17 p.m. on September 29, 2015, Carbondale & Rural Fire Protection District was paged to Distinguished Boards & Beams at 698 Merrill Avenue, Carbondale, for a report of a structure fire. Carbondale, CO – A report of a wildfire sent crews from Carbondale & Rural Fire Protection District to the Cattle Creek area this afternoon. There were multiple reports of lightning strikes in the area. 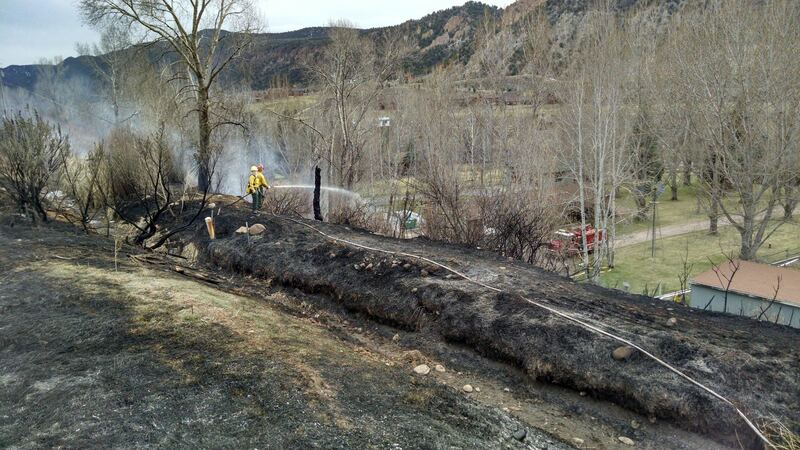 A 50 foot by 50 foot fire was found burning in the pinion & juniper tree on Meadow View Lane, Glenwood Springs. Multiple vehicles and a fuel tank were within 100 feet of the fire when firefighters arrived. Firefighters extinguished the fire with water on the apparatus. Suppression efforts have focused on extinguishing the fire and digging a fire line. Crews were also needed to fall several trees in the fire perimeter. Crews on scene will be performing mop up operations until approximately 7:00 pm. Carbondale, CO Around 3:30 p.m. on Sunday, April 12, 2015, Carbondale & Rural Fire Protection District responded to 0524 Highway 133, for a report of a structure fire. Upon arrival, the firefighters found a commercial business complex with heavy smoke coming from the roof of the building. Carbondale Fire responded with a fire engine, ladder truck, an ambulance and 16 personnel to this fire. Firefighters laddered the building to gain access to the roof. The fire was found to be burning in the roof between two units in the building. Firefighters were able to quickly get the fire under control and stop the fire spread. Both units, along with the roof, sustained fire and smoke damage.